The early 1950's was a period of rapid transformation for Hamilton. Increased competition from post-WWII Europe caused Hamilton to seek out innovative ways to differentiate as well as offer watches at a lower price point. On the differentiation side, watch cases often came in odd shapes with contoured surfaces. In addition, matching expansion bracelets also became commonplace. It seemed the bolder the shape the better. 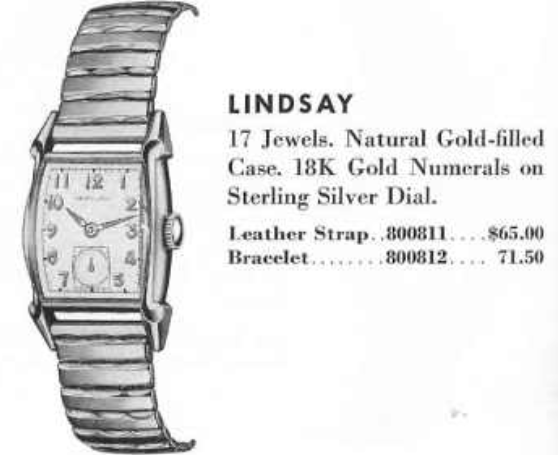 In 1953 the Lindsay was introduced. It seems to be a mixture of Hamilton's traditional design aesthetic with a hint of their new flair. The design is very similar to other models from the same period like the Medford, perhaps too much so as it was only produced for a single year. However, another Lindsay model would be introduced in 1962. The Lindsay came in a 10K yellow gold filled case with a sterling silver dial outfitted with solid 18K gold numerals. Since it came in a 10K gold filled case, you'd be correct to assume that it would have a 17 jewel movement inside. In 1953 the choice for the movement would have been a 12/0 grade and that would be the 752. The 752 is very similar to the 19 jewel 753 in the same way the earlier 14/0 980 was similar to the 982. The 12/0 series also had a Medallion movement for solid gold models, the 754. I recently received a very nice Lindsay in need of little more than a new crystal. The 10K gold filled case back is unremarkable and pops off using the lip between the lugs for leverage. Stainless steel case backs were starting to be introduced to lower costs a little and the newly reintroduced Hamilton Illinois-branded models were the guinea pig. The inside of this case back is stamped with the model name, making identification easy. The 752 looks a lot like the 770 movement that would be introduced in 1955. The 770 just incorporates 5 additional cap jewels. Pretty much all of the other parts are interchangeable. Everything is cleaned and dried before being reassembled with fresh lubricants. A new glass crystal will be a great improvement to this watch's appearance. The movement is reassembled and the mainspring wound back up. Now when I place the balance assembly in position it should start running. The movement goes over to the timer to see what's going on inside. Based on the results shown on the timer's screen, everything looks good. I usually set watches a little fast as they often tend to slow a little after a few hours. As you can see below, a new crystal makes a remarkable difference on an old watch. A gentle polish makes the case really sparkle. It looks great and I will love wearing it!